The Town of Rosemère has obtained financial assistance of $6,900 from Laurent Lessard, Minister of Transport, Sustainable Mobility and Transport Electrification, to improve road conditions along Rue de la Fauvette, located within Croissant du Colibri in Rosemère, right near Autoroute 640. 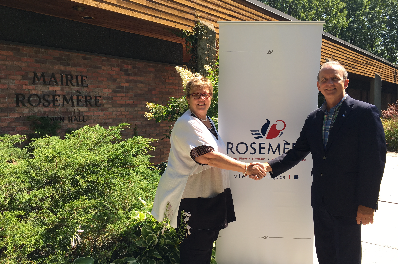 It was Claude Surprenant, MNA for Groulx, who officially presented the cheque to Rosemère's Mayor Madeleine Leduc. Through this assistance program to improve the municipal road system, the Government of Québec is contributing toward financing municipalities' road improvement projects. "Thanks to this program, we were able to carry out road paving operations along Rue de la Fauvette last August. In this way, we can keep our road infrastructures safe and in good condition for residents' and non-residents' use," pointed out the Mayor. As for Mr. Surprenant, he stated: "I am always pleased to contribute toward our residents' well-being."